February 2, 2017 | 3 p.m.
On January 19, a cluster of Bethel staff and faculty members gathered around stainless steel prep tables, chatting as they pulled on hairnets and tied on white aprons in the kitchen behind Monson Dining Center. They had set aside their to-do lists for the afternoon to talk about flavors, cooking tips, and—most importantly—ways for the Bethel community to eat healthier and make wiser lifestyle choices in 2017. Offered by Sodexo, Bethel’s campus dining vendor, the class was designed to raise awareness of Sodexo’s new “Mindful” initiative. Chef Justin Kaderlik C.E.C., who was trained at Le Cordon Bleu in Paris, and Nutrition Specialist Hannah Ender guided participants through the creation of a full meal of Mindful-approved recipes. That means they meet strict nutrition standards for lower cholesterol and sodium, higher fiber content, and being trans-fat-free, and would be labeled with the Mindful icon in the Dining Center and Royal Grounds. The Mindful recipe database is featured on a public website alongside fitness and healthy eating challenges. 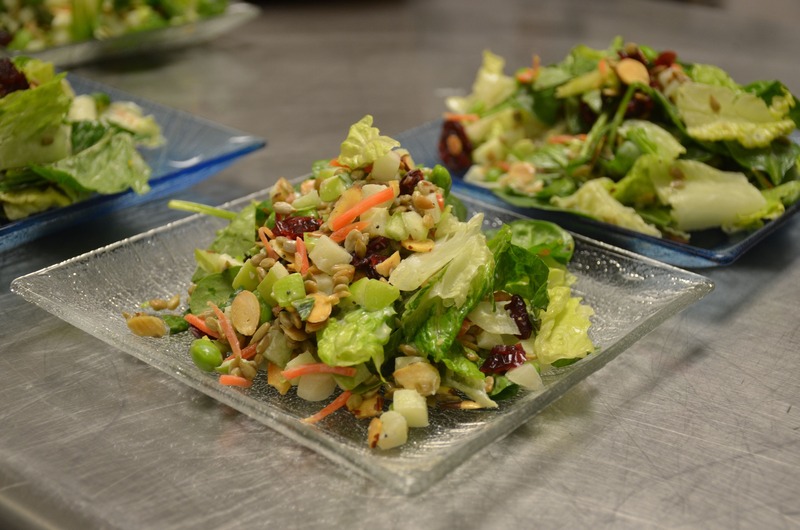 It includes three recipes that faculty and staff tried together—Edamame Nut Salad, Brazilian-Style Chicken and Rice, and Trail Mix Parfait. The corresponding “Bite” app displays nutrition information for Sodexo foods, complete with a barcode scanner and FitBit syncing. The data also syncs with the MyFitnessPal app, giving mainstream phone users access to the same bevy of nutritional info and tips. Sodexo dining menus—like the ones found in Bethel’s 3900 Grill, Royal Grounds, and Monson Dining Center—are specific to each of the thousands of sites serviced by Sodexo Corporate, so Minnesotan campuses might have the locally familiar “hot dish,” while Mississippi might have jambalaya and Maine may feature more seafood. But all the recipes are tied together by a team of nutritionists that keep healthy eating and wider food trends at the forefront. As part of that team, Ender says that Mindful is “a result of Sodexo’s commitment to creating healthier environments for our clients. We want making healthy choices to be easy and enjoyable.” The Mindful logo signifies to guests that “the food they’re choosing is good for them,” Ender says, and she hopes it will become something that dining center guests begin to look for as they move through the line and select their meals. Ender is noticing some encouraging trends in the wider world of nutrition, too, as she’s completing her dietetic internship. She says there’s been a recent push for more fruits and vegetables—and less added sugar—in the American diet. And by 2018, nutrition facts labels will get a facelift to include added health metrics so that there’s more transparency and customers can make more informed choices. 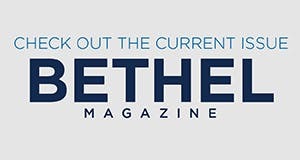 Sodexo—one of the largest food service companies in the world—is on the front lines of bringing those trends to the masses, including on Bethel’s campus. Find out more about Sodexo’s Mindful initiative, or check out other ways Sodexo incorporates healthy options into dining services at Bethel.